I am so excited to feature my sister in today's post! I love including my family members in my posts because the photos always come out so fun & end up being great to look back on! For this post, my sister & I embraced one of our favorite holiday traditions a few weeks early: matching Christmas pajamas! Each year, my sister and I ask for matching pajamas as one of our Christmas gifts & we love wearing them to open presents on Christmas morning. This year, Talbots was kind enough to send us each a pair & they could not be cuter! Not only are these pajamas super comfy & warm (in fact, I'm wearing my nightgown as I type this post!) but the bright colors & fun holiday light print are so festive for the holidays! 2. Ugg Slippers - Ugg slippers are on my own wishlist this year! (I asked for this pair) but I also love this slip-on pair for walking around the house. 6. Free People Scarf - I am scarf obsessed, especially when it comes to the Free People styles. 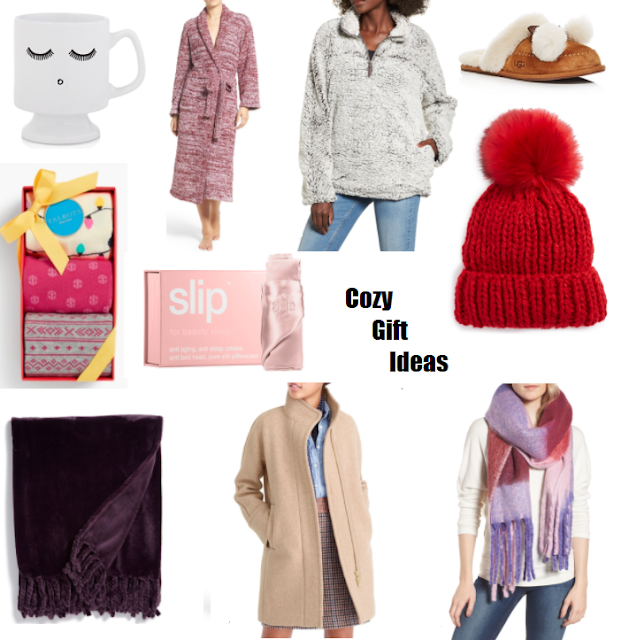 I have included a FP scarf on 3 of my gift guides already! This time I opted for a plaid style. 7. Beanie Hat - You can never have enough winter accessories. I love the major pom pom on top of this beanie. 8. Fleece Pullover - I have seen so many bloggers rocking this pullover lately & it looks SO cozy. I need to get my hands on one! 9. Silk Pillowcase Set - Another item that I have my eye on! These silk pillowcases are supposed to be great for your skin & hair. 10. Cozy Coat - I got this coat for Christmas last year & wear it nonstop! I love the range of colors & classic shape. My favorite! I will be baking tonight! You two are so cute, Michelle!! One of our holiday traditions is to have eggnog and fruitcake (I know, right?) on Christmas Eve!! My mom makes the fruitcake, so it's not as bad as you may think...ha ha!! What fun! How special that she bakes it herself. I follow on Instagram. We like to an advent activity calendar. Those pajamas are so cute! I love the Christmas light bottoms. new christmas pjs are the best ever! fun post! These pjs are so cute! Love all your cozy picks too. Happy friday Michelle! Me too! I plan to bake red velvet cookies tonight! Looks like you guys are having fun! Cozy pjs are indeed a must-have for the holidays. You guys are so cute! I love seeing how you both really love each other and have a great relationship. It reminds me of me and my sister! It's one of our favorite traditions!